It was great to see so many familiar faces at Money20/20 in Las Vegas this week, the payment industry’s biggest event of year. If you didn’t make it or simply had three days of back to back meetings, let us distill down the biggest trends. Let’s start with international payments before we look at some broader insights. The tech giants are largely staying out This topic came up on a regulatory panel. The general consensus is that with the tech giants making super-normal profits, why would they want to enter highly competitive, heavily regulated financial space? 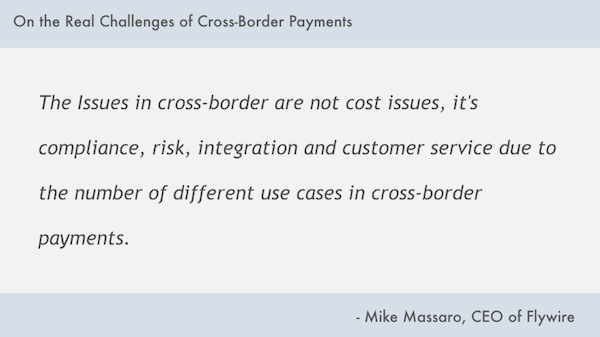 Payments is a small percentage of their underlying margin and brings disproportionate risk. So for all the talk of Amazon, Google and Facebook being able to take over payments, nothing suggests they are actually going to do it. Emerging markets will not be an easy win Latin America received a lot of attention at the event but the evidence continues to suggest that it is local companies with local expertise that are winning in the region. There are very few case studies of overseas companies successfully entering these markets. What does that mean? Partner up or acquire and be wary going alone. Three items stood out for me and others I talked to at the conference. Compliance, KYC, AML, PSD2. None of these issues are going away and more so, there is an arms race to on-board and continually monitor customers faster and more accurately. Whilst the “tech” in RegTech is often overstated – 1,000 people overseas manually reviewing documents is not tech – more and more data is being thrown at these problems. Flexibility seems to be the best approach here so as not to lock in too tightly to any one provider in what is a fast changing sector. The most overused term at the conference was AI. Whilst it is meant to mean Artificial Intelligence, few of the companies claiming to offer AI capability can actually execute at that level. Most surprising to me was the lack of bank presence at the conference. Not one major bank had a stand in the main exhibition hall. Whilst some banks sent reps from their team (a big presence from Barclays and Wells Fargo had a stand outside the hall), this is the first time they have been absent as major exhibitors. Only time will tell whether the SIBOS bank conference pulled many away or if presenting themselves next to all the hot new things is not where the banks want to be.